This issue hit the stands on March 1, 1988. This issue featured Cap’s JLI friends and his first meeting with Red Tornado. 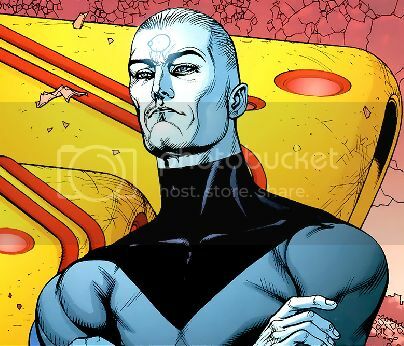 When this issue opens, General Eiling and Dr. Megala are looking at images of Captain Atom taking a beating from Major Force (from the last issue) and discussing whether or not Force should be reprimanded. Dr. Megala thinks he should be, but Eiling says that since Nate quit the Air Force, he had that beating coming to him. Megala warns that if the surveillance video of the fight ever gets out, it would be devastating to their project. Eiling says that isn’t a concern; he is having Allard wipe the tapes. He begins to wheel Megala out of his command room, but is intercepted by Babylon. Allard reports that Major Force is again under control as Babylon wheels Megala away, and Megala continues to beat himself up over the mess he’s gotten Nathaniel Adam into. Back in his apartment, Nate has made the discovery that bruises acquired in his metal exo-shell also appear on his human non-super-hero face. Nate is upset that he couldn’t stay away from Major Force and Dr. Spectro. Upon leaving his apartment (wearing dark sunglasses and a fedora to hide his bruises), Nate discovers an eviction notice on his apartment door. He pawns his watch for $375. As he walks home contemplating his bills, Nate discovers a business called “Mellow Yellows.” The sign outside declares it an “authentic 60s nostalgia outlet,” and that they buy and sell memorabilia. Inside Mellow Yellows, two boys are arguing about the first astronaut to go up in a Gemini capsule. One says it was John Glenn, the other insists it was Gus Grissom. Nate cuts in and says it was actually Alan Shepard and that the model the two are arguing over is of a Mercury capsule, not Gemini. The owner of the business comes over and introduces herself as Starshine Stone. Nate introduces himself as Cameron Scott and asks how much she’ll give him for an authentic JFK keyring from the 1960 presidential campaign. She offers him $250 and then tells Nate if he can answer four more “vintage questions,” she’ll pay him double. Of course, Nate wins the wager. After all, it was the 1960s just a year or so ago for him. After a little shameless flirting with Starshine, he leaves the store with his slightly-ill-gotten $500. The story cuts to a couple of freaked-out meteorologists (probably at the National Weather Service). They are very worried about a storm brewing off the Eastern seaboard of the United States, from the Gulf of Mexico as far north as Washington, DC. Not only is the storm massive, but one of the meteorologists thinks it is alive. He warns his coworker that they must notify the Governor, the National Guard, and the Justice League. At the JLI New York Embassy, Blue Beetle is on monitor duty when the warning comes through. Beetle assembles the Justice League. Mister Miracle, Black Canary, and Booster Gold come running. The hurricane is somehow “saying” that it has a duty to cleanse the Earth. With Blue Beetle as acting leader, the JLI piles into the shuttle and heads towards the eye of the storm. As they approach, some relief workers on the ground who are busy piling sandbags hear the “voice of the storm.” It says, “I descend upon the Earth to rid it of the impurities which have tainted its skies for so long! 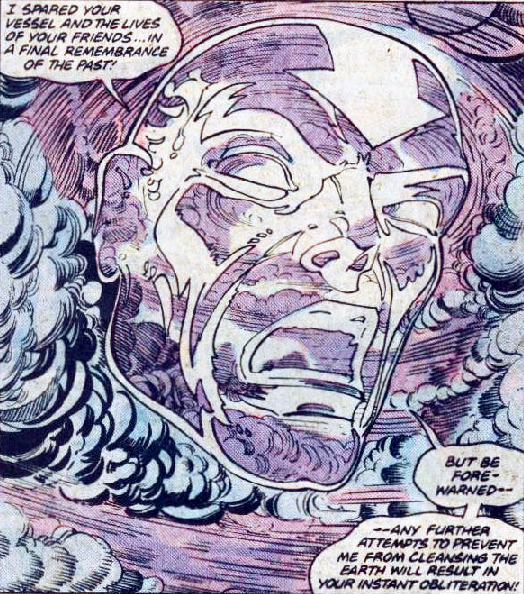 For I am the elemental of the air!” This is the first mention of elementals in the pages of Captain Atom, and it is an important theme throughout the title’s run. On the shuttle, Black Canary recognizes the voice of the storm as that of her old team-mate Red Tornado. She uses her sonic scream to communicate with the Red Tornado elemental/hurricane. In response, the storm blasts the shuttle, sending its occupants flying about the cabin. A giant cloud hand grabs the shuttle and places it on the ground outside the storm’s radius. The JLI emerges from the ship and the face of Red Tornado appears in the clouds and addresses them. He warns that if they try and interfere again, he will kill them. Blue Beetle calls for backup, which means Cap’s pager goes off just as he is buzzing Peggy and Goz up to his apartment. He leaves his friend and daughter a hastily scrawled note of apology and jumps out the window on his way to the storm in Louisiana. The JLI has their hands full saving civilians on the ground and have just about given up hope that their backup will arrive when Captain Atom arrives on the scene. They brief Cap on the situation and point out how dangerously close the storm is to the Langley Nuclear Reactor Plant. Beetle doesn’t believe Cap is up to the task of fighting Red Tornado (based on the bruises on his face), but Cap ignores him and flies towards the storm. Red Tornado knocks Cap into the Gulf of Mexico, but the hero doesn’t stay down. He returns to the storm and begins circling it at a rapid speed. He draws energy from the quantum field to create a counter-vortex that deflects the storm from the path of the nuclear plant. 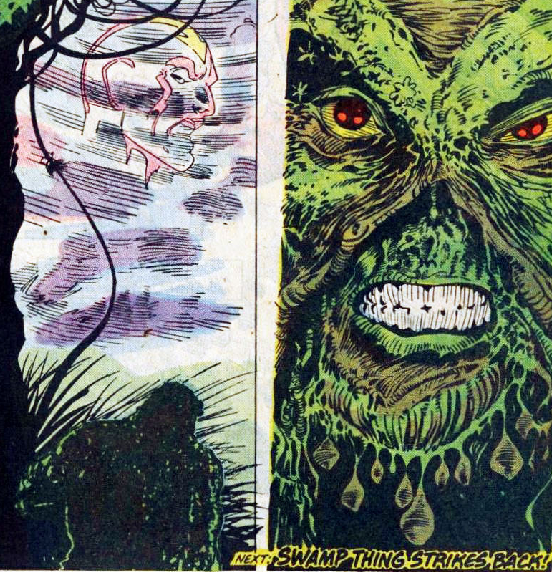 The storm is diverted over a nearby swamp, where the battle is watched by an angry Swamp Thing. To be continued next issue. So we have the earth elemental, the air elemental, and Captain Atom facing off in the next issue. It promises to be an epic battle. This wasn’t a spectacular story. 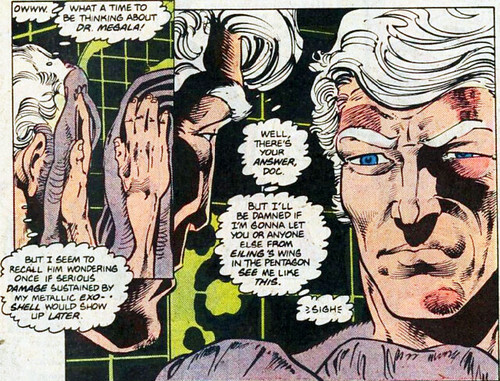 I do like Blue Beetle’s mistrust of Captain Atom for no particular reason that is hinted at in this story, though. I never cared much for Starshine Stone, either. I don’t know why she bugs me. I give it the story B-. But Pat Broderick and Bob Smith have knocked it out of the park again. A for art.